[T]here are historic situations in which refusal to defend the inheritance of a civilization, however imperfect, against tyranny and aggression may result in consequences even worse than war. From the perspective of society the highest moral ideal is justice. From the perspective of the individual the highest ideal is unselfishness. Society must strive for justice even if it is forced to use means, such as self-assertion, resistance, coercion and perhaps resentment, which cannot gain the moral sanction of the most sensitive moral spirit. God, give us the grace to accept with serenity the things which cannot be changed, courage to change the things which should be changed, and the wisdom to distinguish the one from the other. Niebuhr at one point claimed authorship (and took copyright fees from Hallmark Cards), but later on denied he had written it. It was later adopted by Alcoholics Anonymous. Discussion of the actual authorship here. Fanatic orthodoxy is never rooted in faith but in doubt. It is when we are not sure that we are doubly sure. 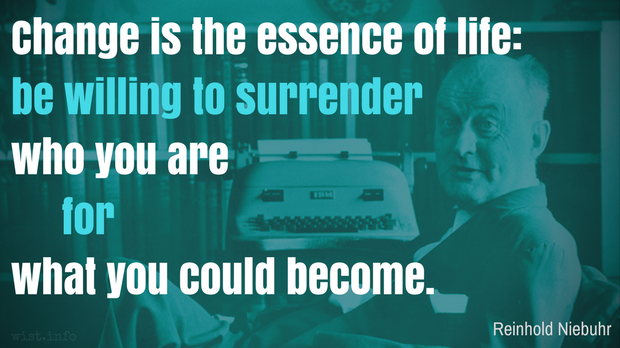 Change is the essence of life: be willing to surrender who you are for what you could become. Sometimes elided to: "Change is the essence of life: surrender who you are for what you could become." There is no social evil, no form of injustice, whether of the feudal or capitalist order, which has not been sanctified in some way or another by religious sentiment and thereby rendered more impervious to change. The real problem of our existence lies in the fact that we ought to love one another, but do not. Love must be regarded as the final flower and fruit of justice. When it is substituted for justice it degenerates into sentimentality and may become the accomplice of tyranny. Looking at the tragic contemporary scene within this frame of reference, we feel that American Christianity is all too prone to disavow its responsibilities for the preservation of our civilization against the perils of totalitarian aggression. We are well aware of the sins of all the nations, including our own, which have contributed to the chaos of our era. […] Yet we believe the task of defending the rich inheritance of our civilization to be an imperative one, however much we might desire that our social system were more worthy of defense. We believe that the possibility of correcting its faults and extending its gains may be annulled for centuries if this external peril is not resolutely faced. Humor is the prelude to faith, and laughter is the beginning of prayer. The worst human conflicts are conflicts between righteous men who are too self-righteous to know how evil they are. They are conflicts between nations and cultures who do not recognize how partial and relative is every value of human devotion. It is the human effort to make our partial values absolute which is always the final sin in human life; and it always results in the most bloody of human conflicts. Human conflicts are so terrible precisely because human beings are always engaged in the pretension of being like God, that is, fighting for some absolute and final good. The weaknesses of the spirit of love in solving larger and more complex problems become increasingly apparent as one proceeds from ordinary relations between individuals to the life of social groups. If nations and other social groups find it difficult to approximate the principles of justice, as we have previously noted, they are naturally even less capable of achieving the principle of love, which demands more than justice. The demand of religious moralists that nations subject themselves to “the law of Christ” is an unrealistic demand, and the hope that they will do so is a sentimental one. This quote was difficult to track down. It's quoted everywhere -- but often attributed to Theodore Parker (as I previously did) or James Russell Lowell. I couldn't find, however, any specific citation from either gentleman. But he who not only feels that he himself has unknown, divine possibilities, but so has his fellow, that democracy means, not I am as good as you are, but you are as good as I am, who seeks as the expression of his own true nature the larger liberty and life for others, is the kind of man essential to construct a new world. The book is a history of Universalism, which may tie into Theodore Parker's Unitarian career. At any rate, the wording does seem to precede Niebuhr, but lacking a solid citation, I'll leave it with him. We find it almost as difficult as the communists to believe that anyone could think ill of us, since we are as persuaded as the communists that our society is so essentially virtuous that only malice could prompt criticism of any of our actions. The separation of church and state is necessary partly because if religion is good then the state shouldn’t interfere with the religious vision or with the religious prophet. There must be a realm of truth beyond political competence, that’s why there must be a separation of churches. But if religion is bad, and a bad religion is one that gives an ultimate sanctity to some particular cause, then religion mustn’t interfere with the state. So one of the basic democratic principles as we know it in America is the separation of church and state.